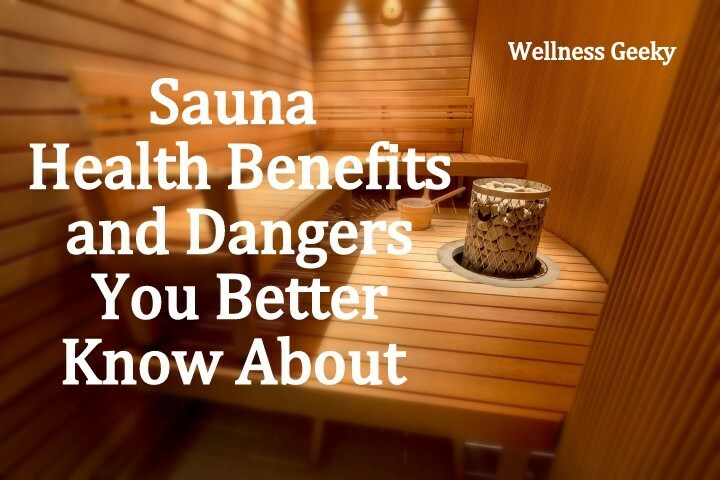 Besides relaxation, there are several health benefits to taking a hot sauna. Saunas raise your body temperature and heart rate and induce sweating, so the benefits are similar to those you get when you exercise. They also eliminate toxins, purify your skin, boost your immune system, and aid in weight loss. 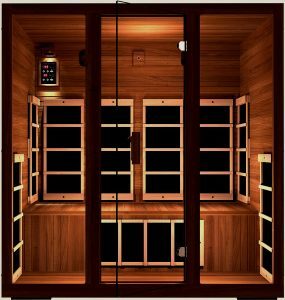 Infrared-heated saunas are one of the latest technologies in sauna manufacturing and are gaining in popularity. Instead of using traditional heat, such as rocks, fire, or steam to raise the temperature in the room, which in turns heats up your body, infrared (also called far-infrared) rays use radiant heat to heat your body directly. Radiant heat provides healthier benefits for the body, very similar to massage. A recent study shows it helps people with chronic fatigue syndrome. It also eases sore and tight muscles and reduces joint pain, especially that related to arthritis. It’s also known to improve acne, psoriasis, and eczema, and eliminate the appearance of cellulite. Note: If you want just quick models model overview of the best infrared sauna for home use, click here or scroll down. Rated in the top ten by Consumer Reports, JNH saunas are top sellers, very popular, have many health benefits, and get consistently high ratings and reviews from customers. They're known for being easy to assemble and install, heating up quickly and efficiently, and having healthy outcomes and good customer service. They are constructed from high quality tongue and groove Canadian western red cedar, which is hearty wood that lasts a long time and maintains its pleasant woodsy smell for many years. They contain eight carbon fiber far-infrared heaters, located at the back, calf, and side areas. The clear doors are constructed of safety glass, so they stand up to higher temperatures inside the unit as well as provide greater insulation. The dual walls also aid in insulation and enable you to install the sauna in smaller spaces because you don't have to worry about wall expansion from the heat. You don't need any tools to set them up because the panels just snap together and hold tight with a buckle. This makes them not only easy to assemble, but portable. If you set it up in one space and then decide to move it to a different location, you can do so without hassle. The music system boasts an amplifier and two speakers, and you can use it with any of your devices. It's equipped with long-lasting LED lights on the interior, which are fifty percent more cost-efficient than regular light bulbs. You can control the length of time you want to spend per session and the temperature of the sauna with the digital control panel. And the JNH brand is widely praised for its warranty, which includes full coverage for five years on all the parts, even the speakers and audio system. 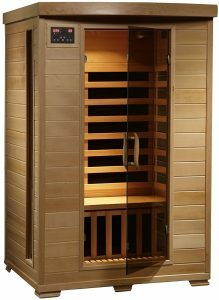 This is the same sauna as the JNH Lifestyles Freedom model, but instead of Red Cedar, it's made from Canadian Hemlock. You get everything else, all of the features are exactly the same. Dual-wall construction for good insulation and the ability to fit it into tight or smaller spaces, eight infrared heaters made of carbon fiber, clear safety glass doors, and the sound system. The only difference between a sauna made of hemlock rather than cedar is that hemlock is a hard wood whereas cedar is soft. Cedar has a lovely natural smell and is naturally anti-fungal and resists rot. 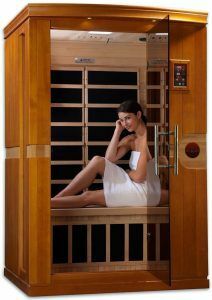 This is a smaller version of the JNH Lifestyles Joyous 3 Person Far infrared sauna. Designed for two instead of three people, it contains 7 carbon fiber heaters. It's constructed of Hemlock as opposed to cedar, a harder wood without the woodsy aroma cedar is known for. It has all the features JNH is known for, including the safety glass construction, easy installation (no tools required), and dual-walls, which aid in insulation and carry no expansion concerns. You also get the premium sound system, including two speakers and an amplifier. The control display is digital and gives you access to the duration and temperature of your sauna. 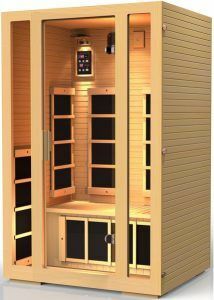 This two-person sauna from Radiant Saunas with six infrared heaters heats up to 141 degrees. It's also made from Hemlock and has the same easy-to-install buckle system kit as the JNH models, making it a quick project to set up or move from room to room. It's reasonably priced, especially when you find it on sale, which you often can. It has a built-in sound system that includes speakers, a radio, an MP3 connection, and a CD player. The door is constructed from tempered glass and is slightly tinted. There are two LED control panels, so you can set or change the temperature either inside or outside the sauna. There are some extra nice-to-have features inside, such as an oxygen ionizer for purifying the air, therapy lights (seven), towel and magazine racks, and backrests. The sauna is covered by a seven-year limited warranty (five years for the heating and electronic elements and a year for the sound system). 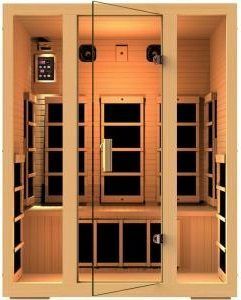 Another made from Canadian Hemlock, this sauna has six dynamic low EMF FAR-infrared carbon panels, which is a technology that produces softer and wider heat that distributes more evenly throughout. The panels are thirty percent larger than their ceramic counterparts, and never have to be replaced. They also allow the heat to be absorbed into the skin more effectively. Designed to be better for the environment, the walls are double paneled, which makes it heat up quickly and hold the heat efficiently and longer, and all of the wood used is reforested. It's easy to assemble (users report it taking less than an hour), and the soft touch LED display control panels are located on both the interior and exterior for setting or adjusting temperature or duration. There's an MP3 connection and speakers for using with any of your devices. 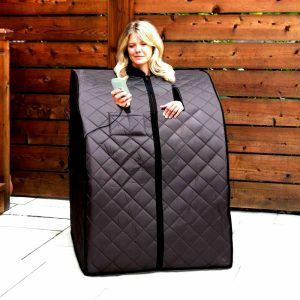 If you like the idea of an infrared sauna, but you don't have the budget, you could purchase a sauna blanket for maximum portability. Alternatively, a lower cost option is the BSA6310 Rejuvenator Portable Sauna by Radiant Saunas. It's double-lined and padded and the zippers are high quality and durable. It's not infrared-powered, but the heating panels are made of carbon fiber and there are five levels of heat to choose from, up to 150 degrees. Many people who want to install an sauna in their home have the same question: Are they safe? The short answer is yes; the longer answer is that any home sauna you choose-whether heated via infrared or a traditional heat source, such as rocks-carries a few risks, all of which can be avoided with common sense and careful choices. It's important to understand that any danger associated with an sauna is not related to the infrared heating rays. The rays themselves are not dangerous in the way that x-rays or ultraviolet rays can be. The precautions you should take to ensure your safety are health-related. If you have any type of injury or you suffer from multiple sclerosis, have silicone implants, tumors, or have had a stroke, you should consult your doctor before using a sauna. If you have no health problems, it's wise to just be mindful when you take a sauna, in the same way that you are with other types of exercise and activity. Make sure you aren't dehydrated and that you drink plenty of water before and after. Watch that you don't get overheated, which can lead to heat stroke or exhaustion. And avoid consuming alcohol before or during your sauna. After wondering about the safety, the second most asked question is usually, "Will a sauna help me lose weight?" This is easy to answer because it's science. Heating your body increases your heart rate and causes you to sweat. The average sauna session will burn between 300 and 500 calories. So, yes, sitting in a sauna will help you lose weight. The important thing to remember, however, is that while you're sweating out water weight, you aren't building muscle or burning stored calories. A sauna is healthy in its own right, for sweating out toxins, increasing relaxation, and purifying your skin. The weight loss is an added bonus, and if accompanied by a healthy diet and exercise plan, that is the best combination for losing weight and maintaining a healthier body and mind. With safety, health benefits, and weight loss considerations out of the way, let's dive into the review. 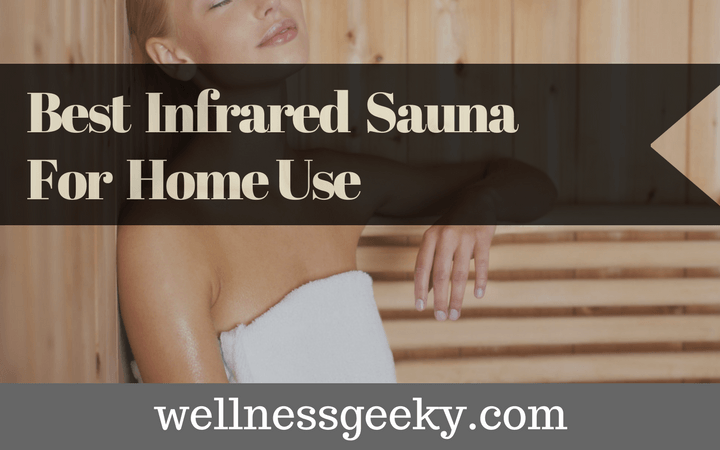 Here's a roundup of the best infrared saunas for two and three people. Among the many benefits that come from Infrared sauna heat, such as increased relaxation and relief from joint and muscle pain, it has even been shown to reduce the symptoms associated with Lyme disease, which affects more than 30,000 Americans a year. Among the top names in the industry are JNH and Rocky Mountain Sauna, and there are lower cost options available if you don't have the space or budget for a full in-home unit. 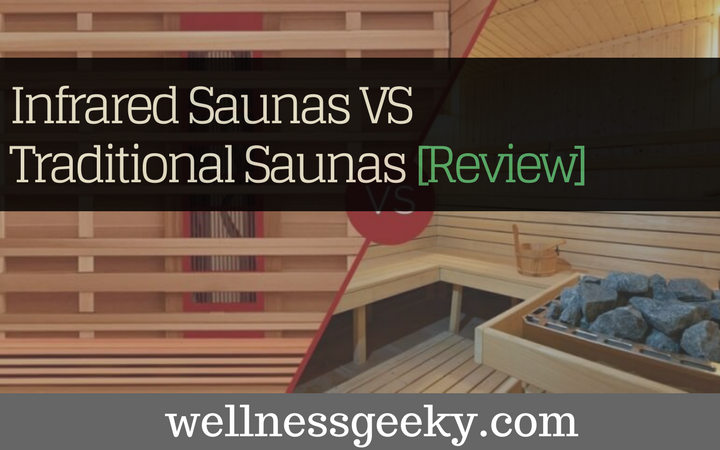 Infrared Saunas vs Traditional Saunas: Who’s the Loser Here?